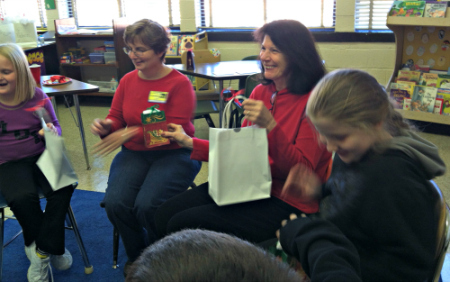 Vicki Lindow (third from left) enjoys a holiday celebration earlier this school year with her mentee, Darla (far right). On first glance, the sight of retired pediatric RN, Vicki Lindow playing in a mud puddle with a little girl who could be her granddaughter isn’t particularly noteworthy, but this is no ordinary nature walk. Lindow has been a mentor to Darla, now in the fourth grade at Denton Elementary School, for the last five years; their trusting friendship developed over time as they shared simple activities like looking for signs of life in rain runoff. “Just playing” has been the key to their relationship according to Lindow. She decided to become a mentor through Communities In Schools of Lexington/Davidson County after some encouragement from her husband, also a CIS mentor and active community volunteer. She has enjoyed seeing Darla grow and mature in a healthy, positive way as a result of their time together. “She now has a new perspective on life as seen through the eyes of another caring adult,” said Lindow, who also volunteers weekly at the Denton Library and is a Master Gardener in Davidson County. Since they began working together, Lindow said she can see the impact she has made in Darla’s life in terms of improved attendance, performance and behavior at school, though she can’t take credit for her mentee’s naturally high self-esteem. “She always has felt good about herself but we’re still working on her relationships with her peers,” said Lindow, adding that she wholeheartedly encourages others to follow her lead and mentor young people in the community.